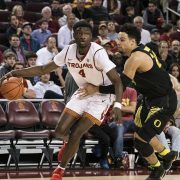 The USC men’s basketball team found its offensive rhythm en route to a imperious 88-54 victory over New Orleans on Tuesday at the Galen Center. It was the first game this year that USC managed 40-plus points in both halves and the first time the team never trailed. The Trojans exploited the Privateers’ defense and shot 16-of-29 (55.2 percent) from the floor in the first half and 31-of-63 (49.2 percent) for the game. Junior guard Elijah Stewart continued his breakout season, and so did freshman guard De’Anthony Melton. Stewart, the team’s leading scorer (17.3 PPG), dropped 21 points, including a stretch of 10 straight points to open the second half. 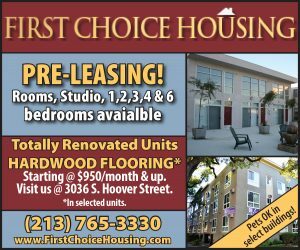 After Stewart’s run, USC maintained a 20-plus-point lead, which allowed head coach Andy Enfield to give his freshmen big minutes. At one point late in the first half, Enfield briefly went with a four-freshman line-up. The offense quickly stalled — along with the transition defense — so he brought back three starters after only a minute. Melton, the Pac-12 steals leader, produced a stellar all-around performance, totaling 10 points, 5 steals, 3 rebounds and 2 assists on 5-of-7 shooting. On defense, USC shut down the Privateers’ leading scorers, seniors Eric Thomas and Christavious Gill, with an imposing zone defense. The duo was averaging a combined 38.3 points per game and shooting 50 percent from the floor entering the game, but the Trojans held them to 23. Most of those points came in garbage time. Gill did not even score until midway into the second half when the game was far out of reach. 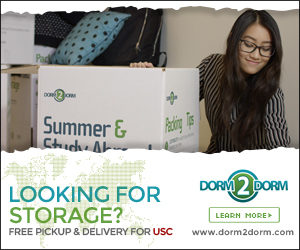 USC forced 19 turnovers and recorded 15 steals. Most impressive tonight was the Trojans’ distribution of scoring and rebounding. Five players scored in double-digits, and nine players recorded at least one rebound. Junior guard Jordan McLaughlin dropped 11 points and nine dimes, and the other “JM,” — freshman Jonah Mathews — had 13 points, his first of many double-digit performances to come. “Our defense and rebounding are why we are 4-0,” Enfield said. The coach also said McLaughlin’s assist totals should be higher. Matthews said he felt comfortable on the floor tonight for the first time this season. He noticed that the team was playing in rhythm and the freshman as if they had been here for more than four games. Despite the commanding win, the Trojans continued several concerning habits. For one, the team struggled to rebound cleanly against the shorter Privateers. 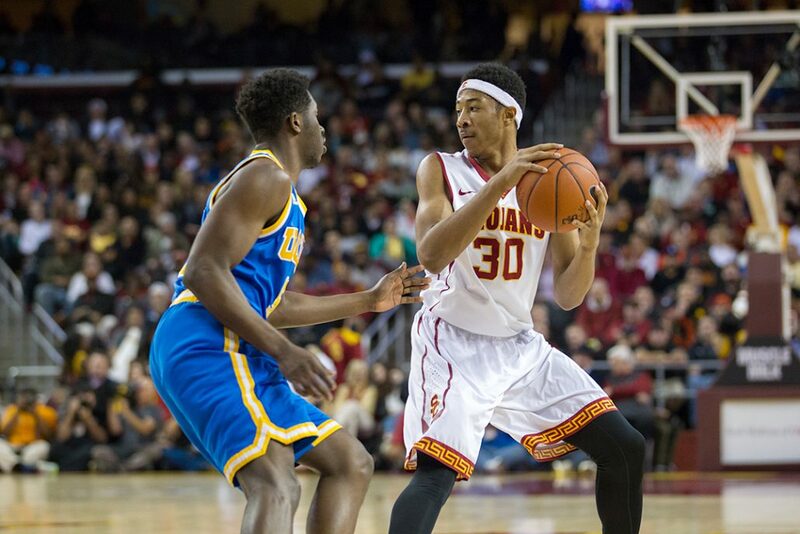 While rebounding was a team effort, the Trojans allowed New Orleans to tip the ball and several times what should have been clean rebounds became 50-50 balls. They only outrebounded the Privateers 40-38. 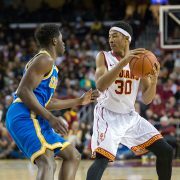 The starting sophomore frontcourt struggled shooting the ball as Chimezie Metu mustered a season-low five points. Bennie Boatwright, meanwhile, shot a disappointing 2-of-11 from the floor and 1-of-7 from distance. “Bennie is an outstanding basketball player and we’re not worried about his shot,” Enfield said. Boatwright recently returned after missing two months of practice due to hip and back injuries. He missed the first two games of the season. 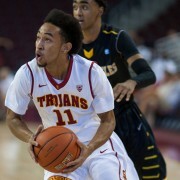 The Trojans seek to continue their early season progress against Southern Methodist on Friday evening.